1. Trauma Research Center, First Hospital Affiliated to the Chinese PLA General Hospital, Beijing 100048, People's Republic of China. 2. Emergency Department, The General Hospital of the Chinese PLA Rocket Force, Beijing 100088, People's Republic of China. 3. Department of Endocrinology, 307th Hospital of the Chinese PLA, Beijing 100071, People's Republic of China. Tumor necrosis factor-α-induced protein-8 (TNFAIP8) is the earliest discovered component of TNFAIP8 family [tumor necrosis factor-α-induced protein-8 like (TIPE) family]. TNFAIP8 contains a putative death effector domain (DED) homologous to DED II in FLIP (Fas-associated death domain-like interleukin-1β-converting enzyme-inhibitory protein), which may affect cell survival/death process. Recently, it has been demonstrated that TNFAIP8 could inhibit apoptosis and autophagy in various types of cells. Moreover, TNFAIP8 level fluctuated evidently in patients with inflammatory, malignant, and autoimmune diseases, indicating that it might be an anti-apoptotic and oncogenetic protein. Herein we will review the discovery, gene/protein structure, pathophysiological functions, and clinical significance of TNFAIP8 together with its potential regulatory mechanism. Tumor necrosis factor alpha induced protein-8 (TNFAIP8) family is a recently described protein family, which plays important roles in immune homeostasis, inflammatory responses, tumor genesis and development as well as cell signal transduction. Many articles regarding TNFAIP8 family were published in the last two decades, which enable us to know the update advances in functions and mechanisms of various member proteins. In this review, we focus on TNFAIP8, the first discovered protein in this family, and elaborate its structure, function, biological and pathophysiological effects, regulatory mechanisms and clinical significance. Discovered in late 20th century, the TNFAIP8 protein family is consisted of 4 different proteins, in terms of TNFAIP8 (TIPE), TNFAIP8 like 1 (TIPE1), TNFAIP8 like 2 (TIPE2), and TNFAIP8 like 3 (TIPE3). These proteins are structurally similar with each other and share approximately 54% identical sequences . Some researchers believe that TNFAIP8 family proteins have rare similarities with other type of proteins except for a common death effector domain (DED) [2, 3]. Whereas, a crystal structure analysis by Zhang et al. showed that the putative DED domain contained in TIPE2 was not actually a DED, but a mirror image of DED in topological structure more accurately, which had six α-helices within its amino acid chain and formed a large cylindrical cavity. This centrally located, hydrophobic cavity may act as a binding site of cofactors and might be associated with immune homeostasis maintenance. Considering the high sequence conservation between TIPE2 and TIPE1, TIPE3 or TNFAIP8, this kind of structure might be a common protein domain shared by all TFNAIP8 family members . It has been indicated that the member proteins behave differently in functions (Table 1) [2-14]. TNFAIP8 can regulate cell apoptosis and is related to neoplasia, tumor development and prognosis. TIPE1 is considered as a pro-apoptosis factor that can enhance cell apoptotic effects. TIPE2 acts as a negative regulator of immune system and inflammatory response, and also has the ability of tumor inhibition. As a transporter of lipid second messengers, TIPE3 is over-expressed in many kinds of tumor tissues, which shows a potential relationship with tumorigenesis. Among these members, TIPE2 is most profoundly elucidated after its discovery in 2008. Nevertheless, there is limited literature available concerning TIPE1 and TIPE3, which were identified respectively in 2010 and 2011 (Figure 1). Patel et al. identified a new transcript in 1997 through comparison of primary and metastatic cell lines from human head and neck squamous cell carcinoma, thus TNFAIP8 was originally called squamous cell carcinoma-subclone2 (SCC-S2) . It has also been named as NDED, Oxi-α, GG2-1, MDC3.13 in the early few years. TNFAIP8 gene is highly conservative among various species [16, 17], and human TNFAIP8 gene is located at 5 chromosome q23 region [18, 19]. The open reading frame of TNFAIP8 gene is a specific sequence in its amino-terminal which is extremely homologous to DED II domain in Fas-associated death domain-like interleukin-1β-converting enzyme-inhibitory protein (FLIP) . There is a growing body of evidence showing that TNFAIP8 is the key regulating gene in murine thymocyte apoptosis induced by glucocorticoid . Likely, TNFAIP8 gene can modulate the immune function of CD4+ T cells both in mice and humans [22, 23]. Recent transcriptome and proteome studies showed that TNFAIP8 knockout resulted in up-regulation of some anti-proliferative and apoptotic genes in different human cancer cell lines, meanwhile, many oncogenes were markedly down-regulated . Differential methylation of TNFAIP8 gene was reported to be associated with the preterm birth rate in the black population . TNFAIP8 mRNA was expressed in various normal tissues and over-expressed in malignant cells. Furthermore, expression of TNFAIP8 mRNA could be activated by tumor necrosis factor (TNF)-α, and up-regulation of TNFAIP8 mRNA inhibited cell apoptosis stimulated by TNF-α . Function of TNFAIP8 family member proteins. Current research situation of TNFAIP8 family. *: PubMed searching in August 2017. TNFAIP8, a 21kD cytoplasmic protein, is reported to be expressed in both cytoplasm and cell nucleus in human prostate cancer cells . Most human normal tissues express TNFAIP8 which is highly expressed in immunity-related tissues such as lymphatic system, spleen, thymus gland, thyroid, bone marrow, and placenta, while solid organs including ovary, kidney, heart, brain, testicle, and skeletal muscle show relatively lower TNFAIP8 expression. Carcinoma tissues can usually over-express TNFAIP8. In addition, it was noticed that TNFAIP8 was enriched in kidney, brain and spleen in rats [2, 27]. It has been indicated that TNFAIP8 appears to be involved in the process of TNF-α induced cell apoptosis. TNF-α can bind to tumor necrosis factor receptor 1 (TNFR1), which then enhance the TNFAIP8 expression through the activation of nuclear factor (NF)-κB. 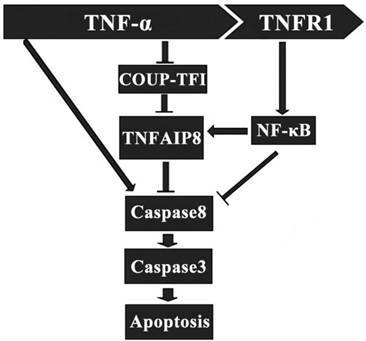 The up-regulated expression and activity of TNFAIP8 significantly inhibit the caspase cascades, which result in a decrease of cell apoptosis (Figure 2) . The orphan nuclear receptor chicken ovalbumin upstream promoter transcription factor I (COUPI-TFI) acts with several transcriptional regulators, combines to the promoter of TNFAIP8 gene and inhibits protein synthesis. TNF-α can reduce the expression of COUPI-TFI in both mRNA and protein level, which boosts the effects of TNFAIP8 (Figure 2) . Laliberté B et al., found that Gαi3 subunit of G protein coupled receptor could prevent cell death and promote the oncogenic transformation of normal cells by direct Gαi3-TNFAIP8 coupling . Regulatory effect of TNFAIP8 in cell apoptosis. TNFR1: tumor necrosis factor receptor 1; COUP-TFⅠ: chicken ovalbumin upstream promoter transcription factor Ⅰ.
Autophagy is another pathway through which TNFAIP8 influences cell survival/death. The Drosophila TIPE family member may be related to c-jun amino-terminal kinase (JNK) signaling, cytoskeletal remodeling and cell autophagy . A dopaminergic neuron study revealed that TNFAIP8 evidently reduced the oxidative stress injury in murine neurons. TNFAIP8 could stimulate mammalian target of rapamycin (mTOR), suppress the development and aggregation of autophagic vacuoles and maintain cell to survive, yet this effect could be obviously reversed by rapamycin, the mTOR inhibitor and autophagy inducer. As an autophagy inhibitor, 3-methyladenine (3-MA) could markedly inhibit the autophagic response in dopaminergic neuron (Figure 3) . A recently released article of the same research team obtained coincident results which highlighted the anti-autophagy effect of TNFAIP8-PE (phosphatidylethanolamine) complex . Mechanism of autophagy inhibition by TNFAIP8 in dopaminergic neuron. 3-MA: 3-Methyladenine; mTOR: Mammalian target of rapamycin. A non-small-cell lung cancer (NSCLC) clinical trial showed that more than 70% cancer tissue samples over-expressed TNFAIP8 mRNA compared to normal tissue, which was correlated to patients' lymph node metastasis, TNM staging, Ki-67 expression in cancer tissue, and poor prognosis . Similarly, another NSCLC research found that TNFAIP8 mRNA level was lower in tumor infiltrated CD4+ and CD8+ T cells, especially in CD8+ T cells infiltrated by advanced stage NSCLC, indicating that TNFAIP8 might affect disease process through its interference with T cell function . In patients with gastric cancer, enhanced mRNA and protein level of TNFAIP8 expression in tumor tissue were positively associated with lymph node metastasis and TNM staging, but negatively with prognosis [18, 36-38]. It was also reported that TNFAIP8 expression had relationship with serum CA72-4 concentration in patients, which was a crucial biomarker of digestive system carcinoma. Thus, down-regulation of TNFAIP8 might be a promising approach for treating human gastric cancer . In mouse model, TNFAIP8-silencing could impair the cancer formation of BGC823 cells in vivo and enhance the anti-tumor effect of anti-death receptor 5 monoclonal antibody (anti-DR5ScFv, an inducer of cell apoptosis) . As we known, microRNAs can regulate protein translation in post-transcriptional level, once dysfunctional, cancers may be developed. From a report by Gao et al., TNFAIP8 was found to be a direct target of miR-9 in human gastric cancer and over-expression of miR-9 significantly down-regulated the expression of TNFAIP8, thereby inhibiting gastric cancer cell proliferation . In human liver cells, the Hippo signaling pathway promotes intercellular contact inhibition, diminishes cell proliferation and induces apoptosis, which is of great significance in progress of hepatocellular carcinoma. TNFAIP8 could inhibit the phosphorylation of large tumor suppressor 1 (LATS1) and Yes-associated protein (YAP), reduce their translocation into nucleus and down-regulate the expression of downstream genes, which might accelerate the invasion and metastasis of hepatocellular carcinoma. Regression analysis revealed that TNAIP8 was an independent prognostic factor of hepatocellular carcinoma . With 56 pancreatic cancer patients included, a clinical trial conducted in 2012 showed that poor differentiation cancer tissues expressed higher level of TNFAIP8 which positively correlated with tumor staging, lymph node metastasis and tissue expression of epidermal growth factor receptor (EGFR) . Current treatment for colorectal cancer is unsatisfied in case the patients present with diseases in advanced stage. A Chinese study demonstrated that over-expression of TNFAIP8 was commonly seen in colon cancer cells, which could modulate the activity of cyclin D1 and phospho-Rb, motivate cell transition from G1 phase to S phase. These results make TNFAIP8 a candidate therapeutic target in colon cancer . In esophageal squamous cell carcinoma, TNFAIP8 expression was correlated to tumor's TNM stage, metastatic ability, prognostic situations as well as the lymphoid system relapse after Ivor Lewis esophagectomy [43, 44]. It was reported that TNFAIP8 level in human papillary thyroid carcinoma tissue was significantly elevated compared to that in adjacent noncancerous thyroid tissues, more intriguingly, TNFAIP8 levels in peripheral and tumor infiltrating CD4+/CD8+ T cells were increased, contributing to the immune pathogenesis of thyroid carcinoma . The polymorphism of TNFAIP8 gene may affect the Non-Hodgkin's lymphoma (NHL) susceptibility in Chinese population. A 514 NHL patients case-control report showed that TNFAIP8 rs1045241 CC genotype populations were more susceptible to both T and B cell NHL than those of CT/TT genotype [19, 46]. Meanwhile, TNFAIP8 genotype was found to be correlated to other types of hematologic carcinoma including diffuse large B-cell lymphoma, acute myeloid leukemia, and multiple myeloma [47-49]. “Promoter Array” analysis of human prostate cells [50, 51] screened out eight genes including TNFAIP8, which were differently methylated in their promoter regions between prostate epithelial and cancer cell lines. Differentially methylation and regulation of TNFAIP8 gene predict its potential role in the pathogenesis of prostate cancer. For example, androgen could induce prostate cancer cells to over-express TNFAIP8, and TNFAIP8 expression in both cytoplasm and nucleus was correlated to the severity of prostate cancer. Furthermore, nuclear TNFAIP8 level was an independent predictive factor of cancer recurrence. However, knockdown of TNFAIP8 was found to be associated with increased expression of several anti-proliferative and apoptotic genes and decreased levels of multiple oncogenes as well as onco-proteins. Transcriptome study identified that an intron of human TNFAIP8 gene was useful in the diagnosis/prognosis of prostate cancer . Also, TNFAIP8 gene affected the function of androgen receptor in LNCaP cells, a human prostate cancer cell line . TNFAIP8-karyopherin α2 immune complex in LNCaP cells facilitates the transportation of TNFAIP8 into nucleus, which could interact with integrins and matrix metalloproteinases (MMPs), and accelerate the progression of prostate cancers . In endometrial cancer patients, TNFAIP8 expression was evident to be correlated to patients' international federation of gynecology and obstetrics (FIGO) stage, cell differentiation, depth of myometrial invasion, lympho-vascular space invasion, lymph node metastasis, cancer relapse, and prognosis. Likely, TNFAIP8 over-expression had strong correlations with Ki-67 and MMP-9 levels in tumor samples . In cervical cancer, TNFAIP8-rs11064 polymorphism interfered the bond intensity of miR-22-TNFAIP8-mRNA combination. Patients with GG genotype over-expressed TNFAIP8 and showed higher risks for cervical cancer . In epithelial ovarian cancer patients, TNFAIP8 over-expression was associated with tumor metastasis, platinum resistance, and prognosis [56, 57]. The tumor-suppressive miR-99a is repressed in human osteosarcoma (OS) cells, and restoring its function can inhibit cell proliferation and induce apoptosis. Luciferase assay showed that miR-99a bound with TNFAIP8 directly and specifically, and up-regulation of miR-99a drastically depressed the TNFAIP8 mRNA and protein level in OS cells. These findings suggested that miR-99a played a significant tumor-suppressing role via its direct target TNFAIP8 in OS and might be a promising diagnostic and therapeutic target for OS patients . With regard to breast cancer, a team from Georgetown University Medical Center performed a serial study in 2004 and 2005. The results showed that TNFAIP8 over-expression increased the cell growth rate and tumorigenicity, up-regulated collagen I level and enhanced cancer migration in MDA-MB 435 cells transfected with TNFAIP8 cDNA . Over-expression of TNFAIP8 significantly augmented the vascular endothelial growth factor receptor 2 (VEGFR-2), MMP-1, and MMP-9 levels in the same cell line, thereby promoting the cancer cells to metastasize . These results coincide with the conclusion of a recent clinical trial which showed that invasive ductal breast cancer (IDC) patients with higher level of TNFAIP8 developed tumors of higher-grade malignancy and possessed shorter overall and disease-free survival time . p53, an anti-oncogene which has the highest relativity with human oncogenesis, often loses its tumor suppressive functions when mutations occur. A rare p53 mutation K120R prompts its encoded protein to bind and active TNFAIP8 gene, which then helps human lung and colorectal tumor cells to survive. Activated TNFAIP8 is also critical for the tumor cells with K120R mutation to evade apoptosis . It was found that a transcriptional variant of TNFAIP8 gene, TNFAIP8 v2, was over-expressed in various types of tumor cell lines, including U2OS, A549, THP-1, HCT-116, Raji, and H1299. Silencing the expression of TNFAIP8 v2 could inhibit the DNA synthesis, enhance the cell cycle arrest induced by p53, and exacerbate the DNA damage. Thus, TNFAIP8 v2 may act as a regulatory target of p53 and impair the anti-tumor effects of normal p53 protein. In cancer cells treated with doxorubicin, p53 protein combined with the enhancer of TNFAIP8 gene, up-regulated the expression of TNFAIP8 v2, and repressed cell apoptosis. This could be one of the causes of doxorubicin resistance . Oncolytic virotherapy is a novel strategy for treatment of cancers. Canine distemper virus (CDV) has been proved to be an oncolytic virus and can induce apoptosis in various kinds of human and canine-derived cells. It was noted that CDV remarkably enhanced the apoptosis of Hela cells through up-regulation of caspase-3 expression . Human breast tumor cell line transfected with CDV showed a lower proliferation rate, and more than 45% transfected cells underwent apoptosis or necrosis. In addition, mitochondrial membrane depolarization was positively correlated with virus titres, and CDV M gene expression with TNFAIP8 as well. These results suggest TNFAIP8 may contribute to the oncolytic effects of CDV . Over-expression TNFAIP8 is frequently observed in malignant cells, which is strongly linked to their excessive proliferation, reduced apoptosis, enhanced invasion and metastasis. Therefore, TNFAIP8 might serve as a predominant pro-tumor factor. Possible modulators and molecular targets of TNFAIP8 in malignant diseases are listed in table 2. Potential modulators and molecular targets of TNFAIP8 in malignant diseases. Compared to C57BL/6J, A/J mouse are more susceptible to Staphylococcus infections, but its potential mechanism is uncertain. It was reported that TNFAIP8 gene located at mouse chromosome 18 had different expression profile between C57BL/6J and A/J mouse which was associated with functional changes of their macrophages. Silencing TNFAIP8 by siRNA, RAW264.7 macrophages showed a significant decrease in IL-1β secretion while an increase level of granulocyte-macrophage colony stimulating factor (GM-CSF) when challenged by Staphylococcus aureus. It was consistent with the peritoneal macrophage changes in mice of chromosome 18 substitution (C57BL/6J mice whose chromosome 18 is substituted for that of A/J mice). These data implied that TNFAIP8 gene might be involved in the susceptibility of A/J mice to Staphylococcus aureus infection . In mice infected by Listeria monocytogenes, TNFAIP8 knockdown reduced the liver and spleen bacterial loads, enhanced hepatocyte apoptosis, and inhibited the activation of Ras-related C3 botulinum toxin substrate 1 (RAC1). The decreased bacterial invasion and increased TNF-α induced cell apoptosis cooperatively protected the TNFAIP8-knockout mice from lethal Listeriosis. Thus, murine TNFAIP8 possibly regulates the pathogenesis of infection of Listeria monocytogenes through RAC1-GTP signaling pathway . In TNFAIP8-deficient mice, they were more sensitive to DSS-induced colitis than wild-type animals, manifested as increased body weight loss, higher level of leukocyte infiltration, bacterial invasion and inflammatory mediator release in colon, but less survived animals. TNFAIP8 deficiency resulted in obvious inhibition of murine intestinal epithelial cell proliferation and malfunction of cell renovation, which indicated that TNFAIP8 might play a protective role in colitis of mice . It was found that TNF-α regulated TNFAIP8 expression via alteration of NF-κB nuclear translocation in human rheumatoid arthritis synovial fibroblasts (RASFs). Inhibition of TNFAIP8 using lentivirus could repress the synthesis of MMP-1 in RASFs. These changes then influenced RASFs apoptosis, migration and multiplication . Horrevoets et al. conducted a gene analysis in human umbilical vein endothelial cells early in 1999, and confirmed several genes positively responsive to TNF-α in vitro and up-regulated in atherosclerotic lesions, which functioned in the process of leukocyte trafficking, vesicular transport, cell cycle control, apoptosis, and cellular protection against oxidative stress. TNFAIP8, a formerly unidentified gene, was among these genes and activated in atherosclerosis, nevertheless, the potential function of this newly found gene remained to be clarified in the development of vascular abnormalities . Diabetes nephropathy is a diabetic vascular complication of the highest severity characterized by hyaline degeneration and proliferative atherosclerosis of glomerular arteries. It was reported that streptozotocin (STZ) induced diabetic rats to over-express TNFAIP8 in their glomeruli, and this phenomenon was also seen in renal biopsies of diabetic patients. In vitro, high glucose environment up-regulated TNFAIP8 expression and NADPH oxidase activity in mesangial cells, which was correlated with cell proliferation. These data documented that rodent TNAFIP8 appears to be a critical factor in the pathogenesis of diabetic renal injury . It has been 20 years since the structure of TNFAIP8 gene, transcript and protein were thoroughly described. Functions of TNFAIP8, such as anti-apoptotic effects, oncogenesis and promoting tumor development, invasion and metastasis, have been supported with substantial evidence from the published researches, and it is considered as a vital factor participating in the process of cell survive and death. However, there are still limits in TNFAIP8 research as its pathophysiological function is not fully illuminated. Most of the existing studies, focusing on malignant diseases, are merely correlation analysis, and do not mention any further regulatory mechanisms. Few data shed lights on TNFAIP8 in immune responses, but some of the conclusions are even contradictory. For example, TNFAIP8 mRNA expression was down-regulated in cancer (NSCLC) infiltrating CD4+CD8+ T cells , whereas others observed an increasing trend of TNFAIP8 mRNA level in tumor (papillary thyroid carcinoma) infiltrating CD4+CD8+ T cells . Both articles were published in 2014 but neither gave any reasonable explanations about this discrepancy. A recent published study using thermal injury mice model only performed a preliminary experiment underlying functions of TNFAIP8 in peripheral CD4+ T cells rather than any other types of immune cells . There are barely any relative researches in areas of sepsis and multiple organ dysfunction syndrome which need to be exploited in future. It is indeed inspiring that some promising progress has been achieved in applications of TNFAIP8. Several studies revealed that TNFAIP8 was associated with treatment resistance of chemotherapy, which might be based on the interactions between TNFAIP8 and p53, thus cancer therapy would be improved through regulations targeting TNFAIP8[55, 57]. Meanwhile, miRNA studies proved the connections between its anti-tumor effect and TNFAIP8 expression, providing new insights into gene therapy of carcinomas [39, 55, 58]. In conclusion, there are still many blank fields in TNFAIP8 research which need to be deeply investigated so that biological and pathophysiological effects of TNFAIP8 and its clinical significance can be more profoundly comprehended in the new era. This study was supported, in part, by grants from the National Natural Science Foundation (Nos. 81730057, 81372054, 81401592), the Beijing Nova Program (No. Z171100001117113), and the National Key Research and Development Program of China (No. 2017YFC1103302). Corresponding author: Yong-ming Yao; E-mail: c_ffcom; Tel: (+86)1066867394; Fax: (+86)1068989158. Department of Microbiology and Immunology, Trauma Research Center, First Hospital Affiliated to the Chinese PLA General Hospital, Fucheng Road 51, Haidian District, Beijing 100048, People's Republic of China.